Crepes are a true wonder-food, ready in minutes, super easy to make, and easily allergy-free (gluten-, dairy-, egg-free!) they aren't just a breakfast food or street vendor snack! Some of the best crepe recipes are savory-filled, melt-in-your-mouth dishes perfect for lunch or as an appetizer. 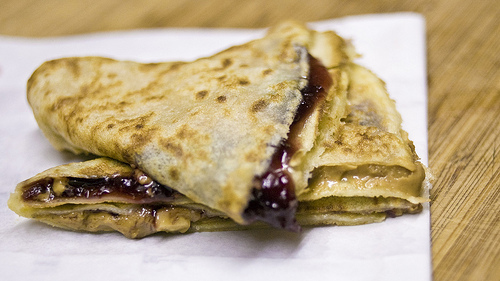 While you can basically put anything inside of a crepe, roll or fold it up and be instantly in heaven, here are 11 amazing recipes to get you started! These crepes are more than just delicious, they're out-of-this-world impressive when you flambe the cognac at the end! Voila! What is better than crepes? Red velvet + chocolate! Also, be sure to check out this earlier post for more red velvet recipes! What better way to celebrate summer than with fresh-roasted persimmons? The quintessential European street snack, what's not to love?! And of course, the coup de grace, a tower of crepes covered in ganache. Is your mouth watering yet?! Straight from Northern France, these crepes are filled with a Mornay mushroom sauce and Gruyere cheese for a spectacular entree! The perfect savory crepe recipe for brunch or dinner. For those of you who remember this fabulous restaurant, you know how, well, magical their crepes were! Here is one of their most popular recipes, resurrected! A sure-fire crowd-pleaser, these crepes are super impressive with limited effort! Perfect for summer! Mix up a batch of savory crepes using our (naturally gluten free!) Crepes 101 recipe or your personal favorite and serve with this delightful filling! From Asparagus & Hollandaise to Wild Mushroom with Wilted Frisee and finally, fresh berries, these vegan crepes are just begging to a part of your next brunch or dinner party! Variations: Replace 1/2 cup of the all-purpose flour with 1/2 cup buckwheat flour for a more traditional flavor!